Coffee is one of the greater joys of this life. But it’s important to know the cultural norms of each place to avoid disappointment – I learned it the hard way. Rule No. 1 is easy: never order a coffee by saying just ‘coffee’. 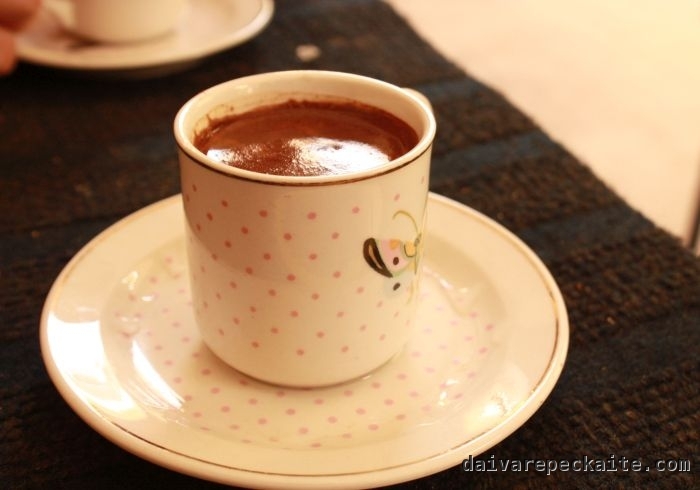 In Portugal, ‘coffee’ means ‘espresso’. In Luxembourg, Lithuania and many other places, it means a regular black coffee, which is a less diluted version of americano. In Malta, by default, ‘coffee’ it means tasteless instant drink. Fair enough, despite being so close to Sicily, this is what local people seem to enjoy. But if you, like me, like the continental style black coffee, espresso lungo is as close as it gets. This entry was posted in Uncategorized and tagged malta, mediterranean escape, restaurant on 2018-02-11 by Daiva. 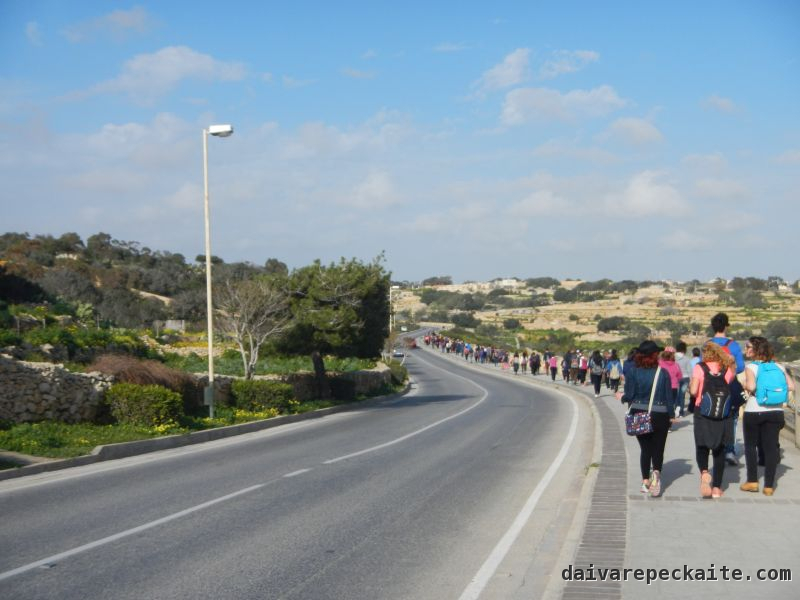 I was among, apparently, around 170 people who signed up for a free tour by Nature Trust Malta to explore Babu valley (Wied Babu). When people sign up to an event on Facebook, one must divide the number by three and extract a square root to know the realistic number of attendees, but hiking tours in Malta are different. When people click they will attend, they actually show up and bring their friends. This is the scale of the ‘invasion’ in Wied Babu. 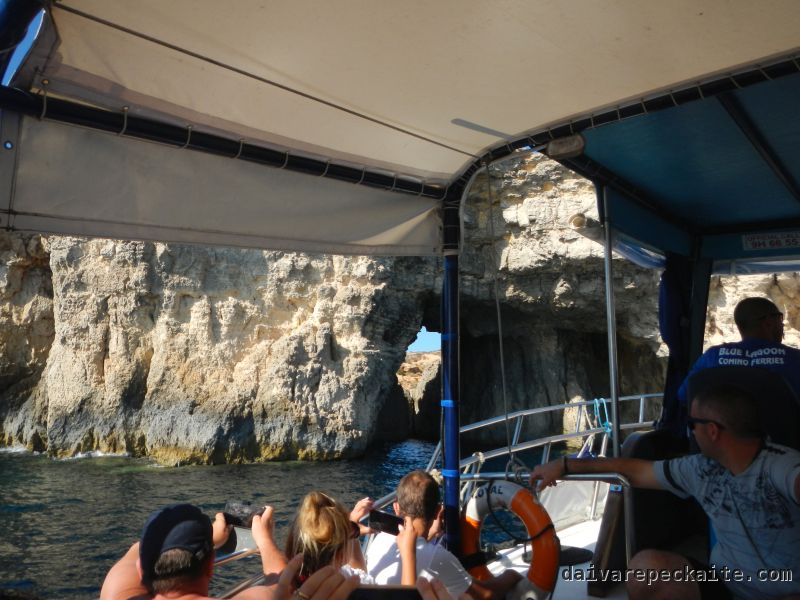 This entry was posted in Travel blog and tagged hiking, yellow spider, malta, mediterranean escape, nature, travel, wied babu, wildlife on 2017-03-19 by Daiva. I like my cities walkable, so as much as I like the Mediterranean island of Malta, sidewalks are something I still cannot get used to. Not only because they are often sloping – this is not different from Vilnius old town. In British English they call them pavements, so there is not even a promise of walk as in ‘sidewalk’. My experience on the island reminded me of my first day in Cairo, when my friend G. instructed me to walk on the side of the road at all times. “You are much safer on the street than on the sidewalk,” he said, contrary to my habits and intuition. Sidewalks there were a colonial imposition – just like traffic lights. They were not used the way I′m used to. I had to accept it – this is simply a different culture, and this is how they do it. I must adjust my mind this way here as well. This entry was posted in Travel blog and tagged cities, malta, mediterranean escape, sidewalk, walking on 2017-01-22 by Daiva. Having worked with Asian Studies over the past couple of years, I heard the argument that, when faced with a vast choice of European locations to visit, East Asian tourists take into account the UNESCO list of world heritage. So I was not surprised at all when I saw that many of our fellow passengers on the bus between Segovia′s distant train station and old town held guidebooks in Asian languages. The small town graces UNESCO world heritage list since 1985 because of its prominent Roman aqueduct and other remains of various eras. Segovia is cute, and its winding streets easily absorb crowds of tourists so that walking there would not feel artificial and de-localized. The aqueduct, over 800 meters long and built, apparently, around 50 BC, is the most obvious tourist spot, where people make selfies, wait for buses or catch taxis to take them back to the train station. The station is notoriously far, buses run quite seldom and are poorly aligned with train schedules – this is probably an incentive to use taxis. Yet with more than two people on board, a taxi pays off. Solo travelers returning to their train could easily find company for taxi sharing by the aqueduct, since most people hanging out around the aqueduct will probably be tourists. 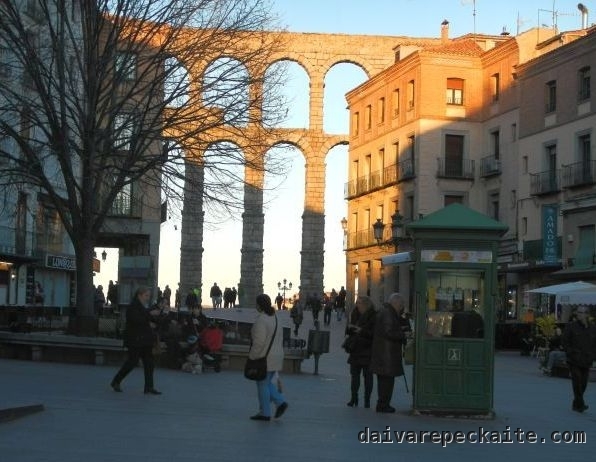 This entry was posted in Travel blog and tagged aqueduct, architecture, jewish, mediterranean escape, roman, segovia, spain, tourism, travel, unesco on 2016-04-01 by Daiva. Nearly everyone I met in Spain praised the beauty of Cartagena. They said it was one of the most beautiful Spanish towns, with ancient history and freshness of a sea breeze. As I was planning my vacations in Murcia region, many travel websites directed me there. So Cartagena was certainly on my map. Perhaps only because of these high expectations it was the greatest disappointment in Spain so far. The strongest impression that stayed with me has to do with lots of closed doors. Ironically, as I found this perfect image to summarize the vibe there, it also captured a hint that something extraordinary and colorful will happen. Indeed, the trip started getting better and better from then on. This entry was posted in Photography, Travel blog and tagged architecture, cartagena, cities, mediterranean escape, museum, roman, ruins, spain, tourism, travel, urban on 2016-03-04 by Daiva. As my travel companion Ugnė wrote (in Lithuanian), Cyprus is rich in well-preserved and accessible ruins, particularly in Famagusta, which she calls the capital of antique ruins. As I wrote in my earlier blog post, people interact with objects in a very direct and laid-back way. Sterility of museums seems to be alien to the local culture. 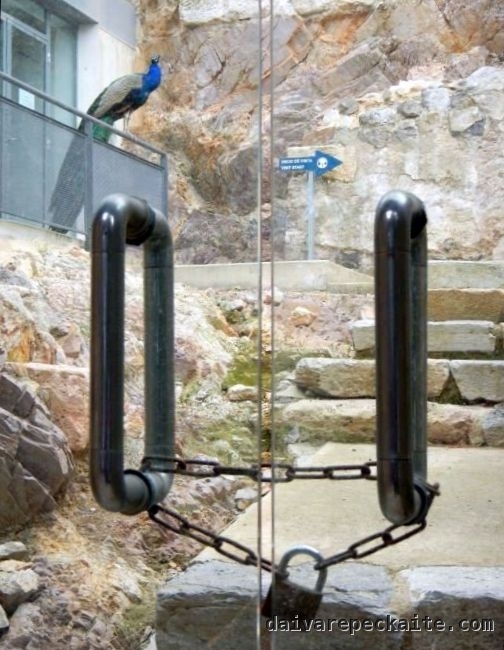 There are museums, of course, but even in them visitors can come closer and interact with objects more directly. This entry was posted in Social issues and tagged antique, architecture, cyprus trip, famagusta, history, kato paphos, lefke, mediterranean escape, ruins, salamis, soli, tourism, travel, urban on 2015-02-02 by Daiva.